I bought this as an extra one to use when I travel since so many bathrooms...even in wheelchair accessible hotel rooms...are not truly accessible. I was surprised that it is exactly like the one I paid over $600 for and, it is, in fact, even sturdier. I would highly recommend this to anyone who needs a portable toilet for the handicapped. Functional. Easy To Install. Lightweight. Safe. Sturdy. Easy to clean. Disabled. Elderly. Residential. Ships easily. We have this unit for my husband's bathroom at home. It is ideal as he is a paraplegic. His greatest fear in traveling is the accessibility of the toilet in our hotel(s). We purchased another of the same product and now ship it to a relative in FL or CA whenever we travel. It has taken away my husband's fears about toileting issues when we're away from home. We now are able to travel more. Sturdy. Functional. Safe. Arms fold down. Extra area for transfer. My father-in-law is an 84 year old paraplegic who recently had a stroke. His mobility is limited. The extra space on each side of the seat allows extra area for him when transferring. Heavy duty and sturdy. It remains in place during transfer. Great product! Comfortable. Functional. Easy To Install. Lightweight. Safe. Sturdy. THIS IS AN EASY TRANSFER FROM WHEELCHAIR AND THERE IS NO TOILET SEAT TO CATCH CLOTHING ON. I cant get the bowl slash guard to fit on commode. please respond as soon as possible. 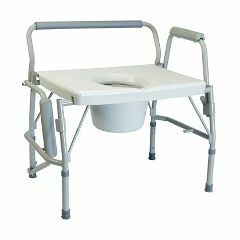 any bariatric commodes for patient that needs one with a 1000lb capacity that is also adjustable in height? How do I empty the commode using the splash guard?